The 2018 Maruti Suzuki Ertiga has finally been launched in India. Here is how it fares against its rivals as far as prices are concerned. New 2018 Maruti Suzuki Ertiga Undercuts the Mahindra Marazzo by over Rs 1.5 Lakh. The 2018 Maruti Suzuki Ertiga has been launched in India. The prices for the petrol manual variant start at ₹ 7.44 lakh and the prices for the petrol automatic start at ₹ 9.18 lakh. The diesel variant prices start at ₹ 8.84 lakh. All prices are ex-showroom, Delhi. In total, there are 10 trims of the Ertiga available in five colour choices and two engine options. The new-generation Maruti Ertiga is built on Maruti's Heartect platform and also gets a new 1.5-litre petrol engine along with the old 1.3-litre DDiS diesel engine unit. The overall design is completely new and the Ertiga has grown bigger in size as well. Comparing to the old generation LXi, the base LXi version of the new generation Ertiga is more expensive than ₹ 1 lakh. Of course, it gets a bunch of added features as standard too which were not present on the previous generation model. The price difference in other petrol trims of the old and the new Ertiga range from ₹ 50,000 to ₹ 70,000. The LDi and the ZDi diesel trims are priced similarly to the old models. But the top-spec trims such as the ZDi and the ZDi+ are about ₹ 44,000 and ₹ 21,000 more expensive when compared to the same models of the previous generation Ertiga. But let's see how it fares when the pricing is compared to its closest rival, the Mahindra Marazzo. The Maruti Suzuki Ertiga gets 10 variants while the Marazzo has only four. Moreover, the Marazzo is available with only a diesel and the Ertiga gets both petrol and diesel engines. The base variant of the Ertiga petrol costs ₹ 7.44 lakh and goes up to ₹ 9.55 lakh for the top spec ZXi automatic, which still remains under the ₹ 10 lakh mark. So, customers looking for a people mover within ₹ 10 lakh have the new-gen Ertiga petrol as a great option. Talking about the diesel side of things, Both Ertiga and Marazzo have 4 variants each and the Marazzo is significantly expensive when compared variant to variant. While the base trim of the Ertiga diesel is ₹ 8.84 lakh, the Marazzo M2 is priced at ₹ 9.99 lakh. You go up all the way till the top-spec model and the difference between the prices of the Ertiga and the Marazzo is exactly ₹ 3 lakh, which a significant difference. 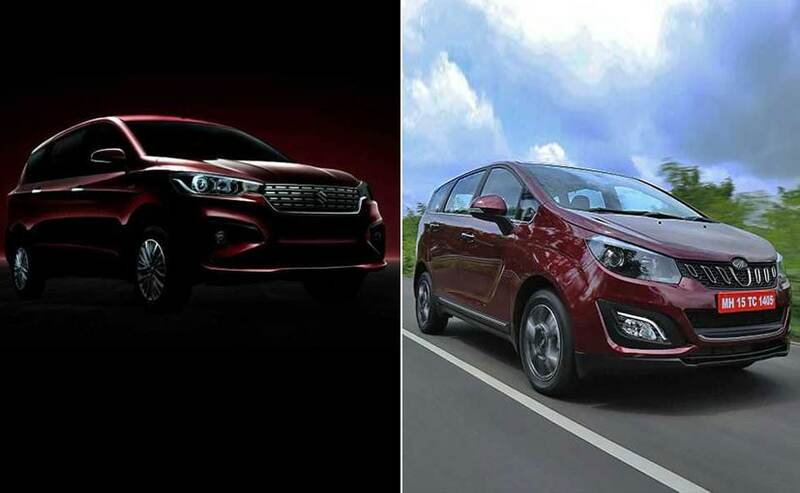 Apart from the Marazzo, the other two vehicles which could rival the Ertiga are the Renault Lodgy and the Toyota Innova Crysta. The prices for Renault Lodgy start at ₹ 8.63 lakh and go up to ₹ 12.11 lakh (ex-showroom, Delhi). Renault offers seven variants of the Lodgy but as far as pricing and sales are concerned, the Lodgy is not best-selling model in the segment. Similarly, the Toyota Innova Crysta has always been hot property! But in terms of pricing and features it is easily two segments above the new-generation Ertiga. The prices for the Innova Crysta start at ₹ 14.65 lakh for the base petrol variant and goes up all the way to ₹ 22 lakh for the top spec diesel variant. Also, Toyota offers a total go 14 variants of the Innova Crysta, six in petrol and eight in diesel.